The process is simple. If you make a donation in any amount, Ms. Pearlstone will help your child during library time to select a Birthday Book. They can select their favorite book from the shelf or order a new book. 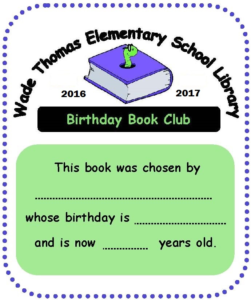 After they have chosen a book, they will be able to write their name and birth date on a commemorative Wade Thomas bookplate that will be put in the front of the book. In addition, the spine of the book will receive a blue universal library symbol so that other children can easily find the Birthday Books that others have chosen. Books generally cost between $15 and $35, but any amount is appreciated and is tax-deductible. 100% of the proceeds go directly to the library so new books can be purchased. If you’d like to participate in this program you can donate online with either a Credit Card or Paypal (see form below). Or if you prefer to pay by check please make it payable to the WTPA and return to the library or your teacher in the envelope provided. If you have any questions, please contact our librarian specialist, Susan Pearlstone, at spearlstone@rossvalleyschools.org, or Sarah Thongnopneua at sarah_thongnopneua@hotmail.com.